Distorsion, god rays and antialiasing. In this order. And if the framerate raises again, e.g. because you left the crowded city, the view distance increases again. This way you can choose between quality and performance: Smooth fps in combat and best graphics otherwise. You may leave a low GPU load zone and enter a heavy GPU load zone and do not hit a GPU burst wall. You may leave a heavy GPU load zone and enter a low GPU load zone and would see the "nothing" where the opposite wall should be. Shissu's PvP/Game Booster is more effective, but also regonizable and active during combat/on demand only. This add-on is less effective than Shissu's PvP/Game Booster, but more subtile and operates all the time. A "Thank You" to @dorrino and @Cabum for their feedback. Be fair to the system: If you use (adaptive) v-sync, like I do, keep the minimum framerate a few frames below limit (<60). Otherwise the add-on can not detect under-load. As higher your target framerate, as slower the view distance will increase again. If you feel dissatisfied with the second main menu entry for "Addons", take a look at Harven's AS to LAM adapter. If your view distance drops and keeps at minimum (your Minimum View Distance) you may have a problem with an add-on or need a new machine . If in doubt, just don't use the add-on and you will see. Dieses Addon passt die Sichtweite und Partikeldistanz der aktuellen Grafikauslastung und dem Kontext an (Normal, Kampf, UI ausgeblendet) um die Framerate zu stabilisieren. Verzerrung, Lichtstrahlen und Antialiasing. In der Reihenfolge. Wenn die Framerate wieder steigt, zum Beispiel weil Du die überfüllte Stadt verlassen hast, steigt die Sichtweite wieder. Auf diese Weise kannst Du zwischen Qualität und Performance wählen: Hohe Framerate im Kampf und ansonsten bessere Grafik. Möglicherweise verläßt Du eine Zone mit geringer GPU Last und tritts in eine Zone mit hoher GPU Last und wirst nicht von einer Belastungsspitze umgehauen. Möglicherweise verläßt Du eine Zone mit hoher GPU Last und tritts in eine Zone mit geringer GPU Last und würdest das "Nichts" sehen, wo die gegenüberliegende Wand sein sollte. Shissu's PvP/Game Booster ist effektiver, aber auch bemerkbarer und nur während des Kampfes/bei Bedarf aktiv. Dieses Addon ist weniger effektiv als Shissu's PvP/Game Booster, aber mehr subtil und arbeitet die ganze Zeit. Sei fair zu dem System: Wenn Du, so wie ich, (adaptives) V-Sync verwendest, halte die Minimum Framerate unter der Begrenzung (<60). Sonst kann das Addon keine Unterlast feststellen. Je höher die Ziel Framerate, desto langsamer erhöht sich die Sichtweite wieder. Wenn Du nicht mit dem zweiten Hauptmenüeintrag für "Erweiterungen" leben kannst, schau Dir mal Harven's AS to LAM adapter an. Wenn die Sichtweite auf Minimum (15) fällt und dort bleibt, besteht entweder ein Problem mit einem Addon oder Du brauchst ein neuen Rechner . Im Zweifel, verwende das Addon einfach nicht und Du wirst sehen. - Option to change view distance only. Keep particle distance untouched. All sceenshots made at 2560x1440 (WQHD) with "Supreme" texture quality. - Update LibHarvensAddonSettings rev 7.2. Fixed color picker settings. 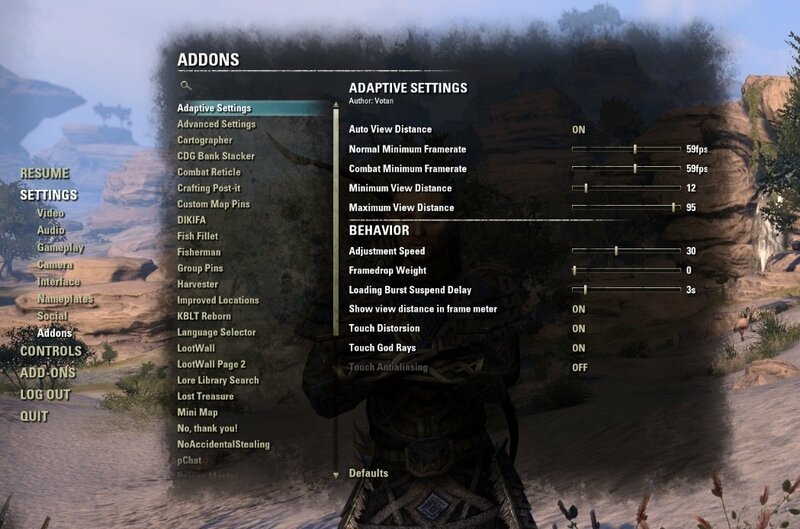 - Do not persist adaptive changes to video settings, so they do not affect character selection screen. - Support for addon "InfoPanel". => Disable own output. - Added API "VOTANS_ADAPTIVE_SETTINGS:GetViewDistanceText()", if InfoPanel wants to include that. - ESO 2.7 'Homestead' ready. 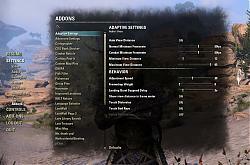 - New option to allow to keep particle distance untouched. - API 100017 'One Tamriel' ready. - Moved "Advanced Settings" to new addon. - Minimum and Maximum View Distance can be configured. - Adjusted relation between "View Distance" and "Particle Distance". - Changed default settings to "high-end". - Due to reproducable frame drops after 5sec occuring at some wayshrines, I increased loading burst suspend delay to 10s. Can be configured now. - Slower increasing of view distance to prevent falling from one frame drop to the next in locations like Orsinium. - Fixed minor bug in settings: Upon showing the settings, the sliders did not change their max value, if different from default. - For Advanced: Increased maximum of "Maximum Framerate" slider to 1000fps, to disable limiting by game. * Limit your framerate via v-sync or driver settings, e.g. nvidia control panel, to prevend overheating! - Enable/Disable auto view distance without reloading UI, including key-binding. - Configurable "Framedrop Weight" of algorithm. Hello, please add the ability to display the view distance without reference to fps. Or add the ability to display the view distance along with latency. And thanks for your mod. This addon is a godsend, and the level of control you provide is flawless. 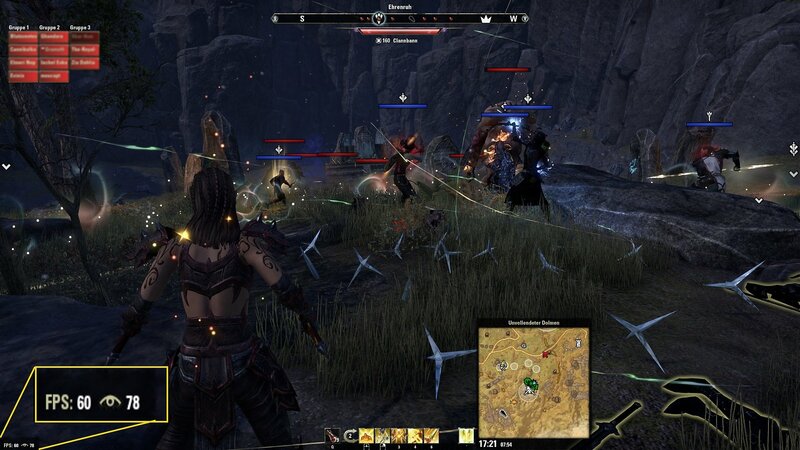 In a game like ESO which struggles with CPU bottlenecks even on cutting edge chips due to game engine limitations, having the most impactful CPU-related settings adjusted automatically to suit the situation is a dream come true. You can get as close as possible to the best of both worlds: Amazing distant views when target FPS allows and smooth gameplay when it matters most (like during combat when you probably aren't looking wistfully off into the distance anyway). The addon compensates the frame drop over time until your reach minimum. try without the addon, if you don't believe. so can not solve it? This Add-On seems to be incompatible with Info Panel since Wolfhunter. Enabling or disabling "/latency" causes that, even without Adaptive Settings. This addon still detects "Info Panel" correctly (just tested) and disables any performance meter modification. They do not have a conflict. So it's a game bug? Cause the Author of Info Panel says it's not his Addons fault. No. Not a game bug. PERFORMANCE_METERS:UpdateVisibility() does what is has to do. Info Panel does not change its behavior. So it re-arranges the controls has if Info Panel would not be installed. Cause it worked fine before Wolfhunter. Something must have changed.. If I force your function for InfoPanel SetupMeterWithInfoPanel(), the view distance is never displayed in InfoPanel. If I force your default function SetupMeter(), but with InfoPanel loaded, I do get the spacing bug. - if self.InfoPanelLoaded is returning false even with InfoPanel loaded, which sound strange as it's the correct name you check out in the plugin list. - Your code for InfoPanel have an issue as when activated, it shows nothing into the panel. I hope it helped a bit. 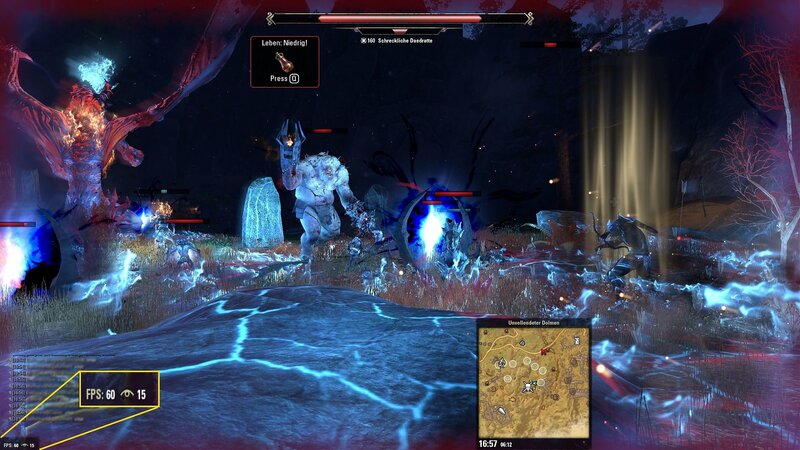 I'm not a LUA big fan neither I do know a lot about ESO API but I did a few test anyway. Last edited by Childeric : 09/16/18 at 09:09 PM. Last edited by AikoTM : 09/01/18 at 05:36 AM. Last edited by AikoTM : 08/30/18 at 05:18 AM. What's this LibStub and Libsomethingsomthing requrements? I look up in my Add-ons list and they are there, but not in Minion. Plus they too are out of date. They are shipped with the addon zip. They can't be out-of-date. Last edited by Jerkling : 06/01/18 at 07:05 AM.